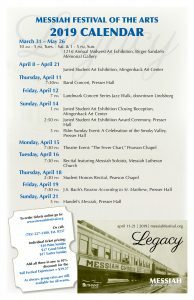 Reception: March 31, 2-4pm with exhibition talks beginning at 2:30. “A Celebration of the Smoky Valley” featuring the Bethany Oratorio Society and students from Salina Central High School, Southeast of Saline High School, Smoky Valley High School, and Inman High School. This concert will feature students from area high schools performing on their own and with the 300 member Bethany Oratorio Society. The Oratorio Society will perform seven selections as accompaniment to writings Bethany Professor Emeritus Linda Lewis has compiled, which highlight the legacy left by prominent past residents of the Smoky Valley, including Birger Sandzen, Carl Aaron Swensson, and Alma Louise Olson. Selections will include, “Come Thou Fount of Every Blessing” arranged by Mack Wilberg, “I Was Glad When They Said Unto Me” by Hubert Parry, and “M.L.K.” originally performed by U2 and arranged for choir by Bob Chilcot. A talkback session will be held following the performance. Ms. Wallace’s collection, subtitled Three Short Visions of the Middle East, offers three short plays, or visions: “A State of Innocence,” “Between This Breath and You,” and “The Retreating World.” The ruins of a zoo (or as Wallace describes it, “a space that once dreamed it was a zoo”) in Rafah, Palestine is the setting for “A State of Innocence.” The vision involves an encounter between a young Israeli soldier, a mysterious Palestinian woman, and an elderly Israeli architect who both builds settlements and attempts to reconstruct what has been destroyed in the protracted conflict. In the second vision, “Between This Breath and You,” a Palestinian father risks arrest to visit the waiting room of a clinic in East Jerusalem after hours and meet face to face an Israeli nurse’s aide to tell about the loss of his son and the impact his death has had on the young woman’s life. “The Retreating World” introduces us to Ali, a resident of Baghdad and a former Iraqi conscript who is addressing the International Pidgeon Convention. A lover of both birds and books, Ali speaks about the difficulties of life after his country’s defeat by U.S. forces, and of the loss not only of his dear friend Samir in the fighting, and the hell of war. The Bethany Oratorio Society will perform its historic and rich performances of J.S. Bach’s “Passion According to St. Matthew” on Good Friday, April 14, and G.F. Handel’s “Messiah” on Easter Sunday, April 16. The Bethany Oratorio Society has been performing Handel’s “Messiah” continuously since 1882 and Bach’s “Passion” since 1929. During Holy Week each year in Lindsborg, the more than 300 member community chorus and orchestra are joined by professional operatic guest soloists for the performances.